It’s becoming a familiar sight to see Jimmie Johnson sprayed with some bubbly after winning his third out of the last four races, finishing first in Michigan for the first time in his career, slightly edging Kevin Harvick to take the Quicken Loans 400 and make it another great day for Hendrick Motorsports and Chevrolet. Johnson is the first driver to reach three wins this season, doing it all in the last month. He won at Charlotte and Dover to end his podium drought, and ended up beating Harvick despite the latter being in the pole to start the race and having the most laps in the lead during the 400 mile, 200 laps race. Johnson came ahead of Harvick by only 1.214 seconds, making it now only four tracks on the current NASCAR schedule on which Johnson hasn’t tasted victory. Johnson took over the lead after 164 laps and went into a pit stop that gave up the lead, but after a cycle of pit stops by others got back on the horse to lead the charge. It was the 69th career win for Johnson, who is aiming to win the Sprint Cup Series for a 7th time, hoping to tie Richard Petty and Dale Earnhardt Senior. Johnson is still trailing Jeff Gordon in the points race, as Gordon’s sixth place finish was enough to keep him in the lead, followed by Johnson and Dale Earnhardt Jr., finishing 7th a week after winning at Pocono. About 200 yards before the finish line, I knew if the car exploded, I’d still slide across the finish line. It was a long time coming. We’ve raced very well up here, and we haven’t been able to close the deal on quite a few occasions. We really were in a win-win situation. Those guys still had to come to pit road to make it to the end. Once I got an idea of how the race was unfolding, I knew we were in the catbird seat, and were able to take advantage of it. Kevin Harvick led more than anyone. He was disappointed after posting the fastest pole winning speed in Michigan since 1987. He led the race for 87 laps, but in terms of strategy was behind Johnson the entire race, as his speed couldn’t make up for his and his team’s errors along the way. It was his third second-place finish this season and he is currently 9th in the points standings, 90 points behind Gordon. Brad Keselowski, who finished second in the previous two races, dropped to third (5th this season), followed by Paul Menard and Kasey Kahne. It was a big day for Hendrick, having four drivers in the top 7. The team has now won five consecutive races, something that has happened for them before in 2007, when a streak went up to six races as well. 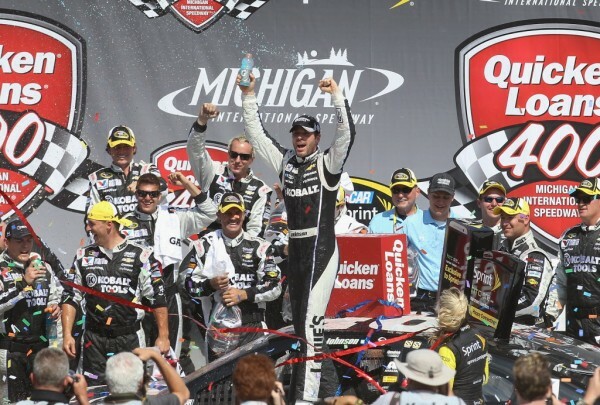 Ford, with Keselowski leading the charge, won the previous three times at Michigan. We kind of trudged through it and came away with another top-three effort, which is good but not great. We want the wins, especially here at Michigan. That would mean a lot. 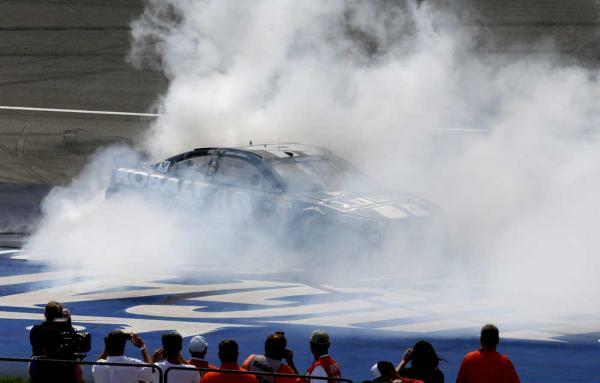 It was a very rough day for Roush Fenway Racing who have the record of 13 wins at Michigan. Greg Biffie finished 20th and Carl Edwards was 23rd. Kyle Busch was forced out of the race because of a problem with his left rear hub. His 41st finish cost him dearly in the overall standings, as he dropped from 6th to 10th, not doing much since winning at Martinsville back in March.